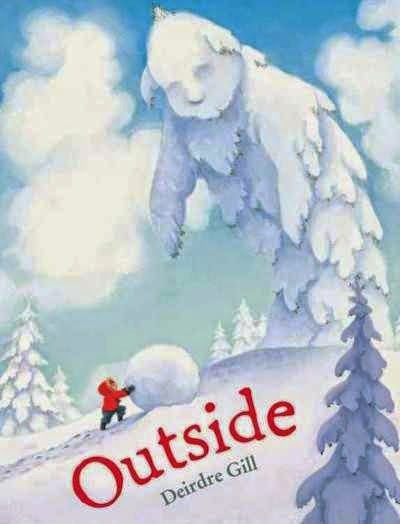 I've loved Lyon's other beautifully poetic picture books, and this seasonal title would be a perfect fit for my library, but I have one quibble that makes me hesitate. Starting with the endpapers, which feature a stark winter landscape, shadowed by a few trees with a squirrel and rabbit in the foreground, the story begins with a forest in winter. The reader catches brief glimpses of a child and dog exploring the winter landscape. Slowly winter fades "Forest knows buds - soft life pushing through hard wood" and spring and the birds arrive. Animals begin to appear and light and green cover everything, but summer is all too brief. Fall arrives and the animals begin to return to their dens, leaves fall and finally winter arrives again. I love the poetic language, which is brief and lovely. In general, I like the pictures, but the second to last spread, which slaps a close-up of the dog's face across the whole book is just...jarring. It doesn't fit in at all with the restrained, natural feel of the rest of the story and art. Some of the collage items interposed across the other pictures felt odd too, but I could see them fitting in with the art upon repeated perusals. I just can't take the cartoony dog's face. Or creepy, depending upon how you feel about staring black eyes. Verdict: I'd love to have this for the beautiful seasonal poetry and the art on the whole, but I will probably pass as there are a lot of season books out there and that weird page just messes it up for me. If I was going to use it in storytime, I'd just skip that page probably. When I finished our huge Neighborhoods project (it hardly seems real that pretty soon I won't be able to say "last year") one of the last things I did was purchase a lot of additional books to fill in weeded sections and empty space. One of the areas I knew we were going to need more titles was in the animals neighborhood. While I purchase almost exclusively from Baker and Taylor, I do make use of one rep who covers Bearport, ABDO, Creative Education, and a bunch of other nonfiction publishers. She came over and we had a cozy sit-down with stacks of catalogs and lots of sample books to discuss. Creative Education's Amazing Animals is one of the series I really liked and while I couldn't afford to get the whole thing, I did buy as many of the most popular animals as I could. Who doesn't love tigers? I had to get tigers. The Amazing Animals series are a large picture-book sized series, heavily illustrated with photographs. Each page includes a simple paragraph about tigers and occasional supplemental information like the definition of a word, extra fact, or caption for a photograph. 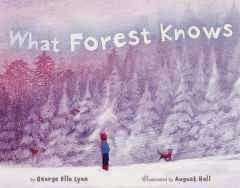 The text is simple enough for beginning readers to tackle or for young children to sit through. A sample paragraph; "Tigers live on the continent of Asia. Some tigers live in forests. There can be a lot of snow there. Other tigers live in swamps. It is warm in the swamps." The book ends with a short folktale about tigers. Back matter is one page including two books for further reading, two websites, and a brief index. The pages are glossy and, unlike the usual bland white background of most easy series nonfiction, has borders that repeat the colors of the photographs. I've had these titles for close to a year and they have held up very well to multiple circulations. The pages are not easily ripped, the bindings are sturdy, and the amount of photographs and colored borders mean there's not a lot of white space to get dingy. Verdict: These are great for kids just beginning to read or to learn about animals. They have enough information for lower grades doing reports and are definitely worth the $20 price tag. If you're getting ready to update your animal series, take a look at these. 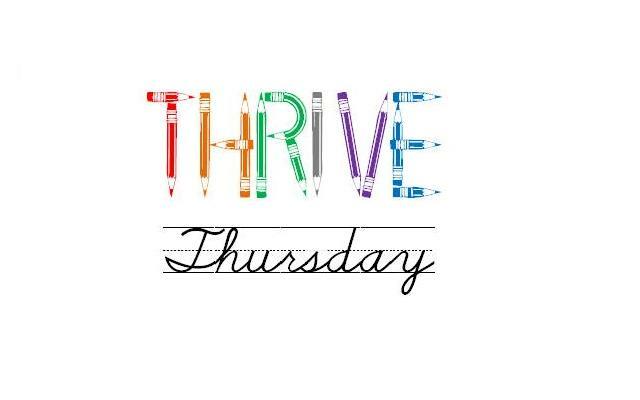 It's time to start collecting awesome school-age program ideas for the December Thrive Thursday round-up! Leave your links here in the comments or over on the Facebook group. I don't know why. I just am. Kohls Wild Theater is an annual event at our library. This year I booked it in May, sent out letters to the schools in August, reminded the schools again in October, forgot that I'd booked it and had a panic attack in early November when I sent out the school information again, and then spent an hour or two creating self-guided tours of the library. Thursday afternoon, I realized I had better put the colored arrows for the tours out NOW and scrambled to do that simultaneously with Lego Club. There was a lot of coming and going of me, my associate, and my aide, but I finished, kids built Legos, and all was well. Until a little girl helpfully collected a big handful of the arrows. Oy. My awesome associate, who does not like seeing her boss cry, put back the arrows and taped them all down. I was lucky to have an adult who likes to attend our after school clubs break down most of the tables and chairs for me. Friday morning, I arrived at the same time as the Kohls van (they were early!) let them in and gave them the run-down of what to expect. I finished setting up the room with chairs, laid down tape markers on the floor, and selected books for a display. Then I finished the last bits of prep for the tours (putting out books and coloring sheets at different points and making sure everything was more or less in order, pennies at the front desk for the wishing well, staff prepared, etc.). At 9:30 three classes of four year olds arrived on their bus and I started them off on the self-guided tours. They had to pace entering the library so they didn't get jumbled up. For the next half-hour, I zipped back and forth between letting the public into the performance room and making sure they sat in the areas delineated for them, checking on the tours ongoing in the library, and connecting up random kids (from the afternoon class) who arrived to join in. At about 9:50 two classes of four year olds arrived from another school (walking) with lots and lots of parent chaperones and siblings. I moved them into their area, made sure they all knew about sitting on their coats and which door to get out of, then shepherded the classes returning from the tours into their space. The program lasted about 30 minutes. During it I clapped, filled out their evaluation form, brought in latecomers, kept an eye on the audience for any emergencies, from sensory overload panic (I don't know if there's a specific name for this, but you know what I mean) to screaming babies, bathroom runs, or fingers in the floor electrical socket that's missing a cover. Afterwards I helped shepherd the two walking classes out their door, helped teachers and parents keep kids from making a break for it, said "hi" to my friends, distributed hugs and coloring sheets, and thanked the teachers for coming. Then I went back into the room and chatted with the classes who had to wait for their bus to come (one of the teachers is also the bus driver) and shepherded them out their various doors. Then clean up the display, pull up the tape, make sure the performers collected all their stuff, and went around the whole library picking up anything left from the tour (including peeling all the arrows off the floor). Normally I'd also have photographs to post to Facebook and organize, but I don't do photography with school groups. And then I left because I was exhausted and I'm working tomorrow. Supervising, shifting nonfiction and holiday books and oversize. Finally dealt with some of the mess of the library pinterest boards by transferring previous school booktalk lists over to my own pinterest pags and slimming down the library's pages. Created self-guided tours for 4K groups on Friday. Football books for a 4th grader - Mike Lupica and Jake Maddox. Wanted movies too, but all I could think of was Wild Soccer Bunch. Made a kid very happy by telling her we just got Chi's Sweet Home 12 in. In the final book if the Emily Feather quartet, Emily's feelings of displacement that have been lingering since the first book, when she discovered she was the adopted human child in a family of fairies, are finally put to rest. However, there are a lot of dangerous adventures before that can happen. Although this book, and the whole series, tackles serious feelings, it's done in a light and gentle way that neither over-dramatizes nor discounts the real emotion Emily feels. Her teen mother is a little overly dramatic and the final revelations about her new baby sister, Wren comes a little pat, but it all fits into the light fantasy feel of the story. There aren't any final and definitive answers; Emily will never know for certain what happened to her birth mother, she doesn't know what her magic will turn into, and her family will always be different but she no longer doubts that she belongs. Verdict: This is an utterly satisfying end to Emily's story. Perfect for fantasy fans who can't handle a 400 page tome of drama and embroiled plots, but like a little more character development than the typical beginning chapter book. Definitely worth taking a little trouble to purchase the UK editions. I love Holly Webb her fantasy series for younger readers. 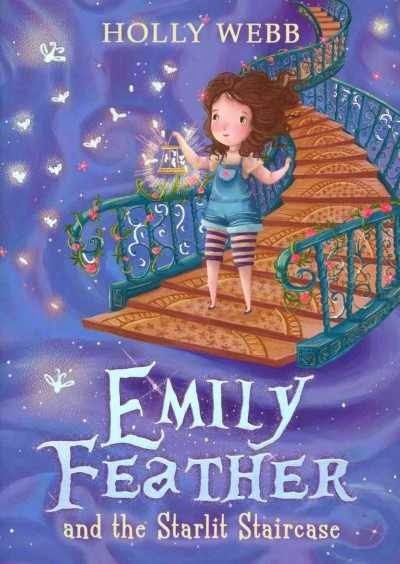 After Emily discovers she's adopted and her family are fairies in the first book, Emily Feather and the Enchanted Door, she has a lot of complicated feelings about where she belongs. 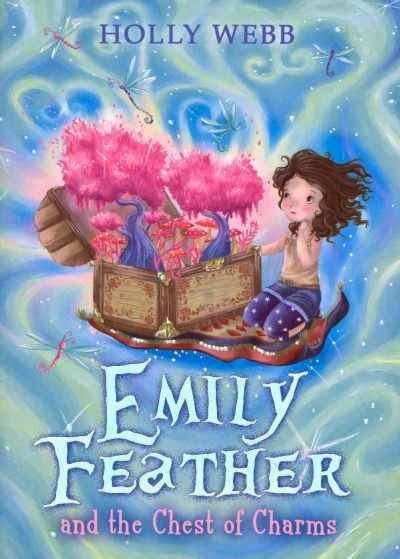 In the second book, Emily Feather and the Secret Mirror, she has some frightening adventures that don't allow her to really deal with these feelings, but do draw her a little bit deeper into fairyland. 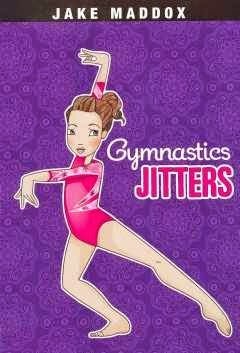 In the third book, Emily's spark of magic and her relationship with her sisters is explored a little more. One of her sisters has apparently become enamored of a boy that none of her siblings, including her twin sister, like. Turns out they were right when he is shown up as a villain. Emily has to force herself past her feelings of inadequacy to join with her sister and brother to save her older sister. In the process, she learns more about her family, has some exciting and frightening adventures, and realizes that she really does have a spark of magic. Verdict: This series just gets better and better. It has all the sparkly magic one expects from a fairy story, an age-appropriate, more serious discussion of what it means to be part of a family, and exciting adventures - all condensed into less than 200 pages. This one is worth purchasing from the UK, since it's not available here in the States, and worth getting in paperback, even if you have to replace it a couple times. Give it to the kids who have outgrown Rainbow Magic but still love fairies and to those who want a fantasy that isn't 400 pages long. This easy reader has been the surprise hit of the year at my library. Easy readers, except for popular series like Fly Guy or Biscuit, aren't usually asked for by title. 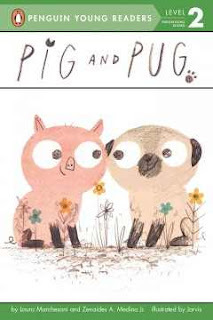 But I've had several enthusiastic kids asking for Pig and Pug. I don't know where they saw it, as I haven't booktalked it, but I'm glad they liked it as it's adorable. Pig is lonely. On his farm, everyone has a job and a friend who is just like them. The cows give milk, the sheep eat grass, the chickens lay eggs. But poor pig is all alone. One day, a strange animal shows up. Is it another pig? Has pig finally found a friend? No, it's a pug. Pig can't be friends with a pug...or can he? Soft pastel illustrations with scribbly details fill out the storyline without detracting attention from the text. Simple details, like Pug's panting tongue and Pig's small but expressive mouth add humor and dimension to the silly and sweet story. This is a level 2 from Penguin, which is still pretty easy. The text is bold and simple with a few more advanced vocabulary words. There are still a lot of repeated words and phrases to keep early readers going. 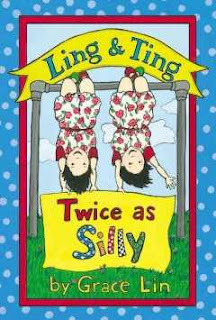 Verdict: This has a subtle but neatly presented message about friendship and differences and is just a light, fun, and deftly presented story. Highly recommended. I have to admit I wasn't really grabbed by this cover, but I'm glad I listened to recommendations to try this one out. The title page shows a dark green wall and, centered on the page, a window looking out at snowy trees. A small red dragon toy lounges on the windowsill. The next spread (whatever you call the pages with the publication information; I am drawing a blank) shows a pale blue landscape and a lonely trail of footprints leading to and around a trio of trees. The story begins with a snowy day and a bored little brother. Reluctantly, he sets out alone into the snowy wilderness. His red coat stands out brightly against the soft shades of white and blue. Surrounded by looming, snow-covered trees he begins to create; a giant snow dog and then a castle. His creations come to life in a blaze of color as a dragon appears and they soar across the snowy landscape. Finally, he bids farewell to his snowy creations in the twilight and heads home, where he meets his brother, finally ready to play outside. This is a wonderful tribute to winter and imagination. I love how the story encourages solitary, imaginative play and the little boy embraces both his time alone playing outside and having fun with his brother. The text is extremely brief and simple, the force of the story coming from the softly glowing pictures that expand the simple story into a creative tour de force. Verdict: Even if you don't live in a place where snow is familiar, this is a simple and lovely celebration of imagination and play. Highly recommended. I am not a huge fan of Seymour Simon. I know, I know, heresy! Everyone loves Seymour Simon! It's not that his books are bad or lacking in quality, it's just that they're not quite what I need when I'm looking for elementary nonfiction. A one-page author's note begins the book, explaining Simon's background as a teacher and interest in explaining the world around him. The book starts with a basic explanation of the characteristics of amphibians, then describes the different habits and habitats of some of the different species. More information about the amphibians is woven into the text describing the various types of frogs. 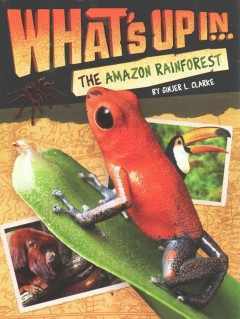 The text is illustrated with large, often full page photos of frogs in different stages of development and of different species in action. The last few pages of the book describe familiar species of frogs in more detail. The final two spreads discuss the importance of frogs in global climate change and conservation. Words in the text highlighted in bold can be found in the back in a short glossary. 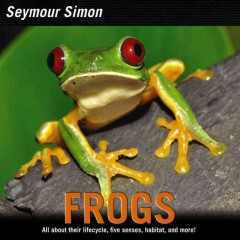 There is also a brief index and links to websites for learning more - Seymour Simon's website, a conservation website for frogs, and the National Wildlife Federation. So, what's not to like? Large font, gorgeous photographs, excellent expository writing. Well, the problem for me is the layout. 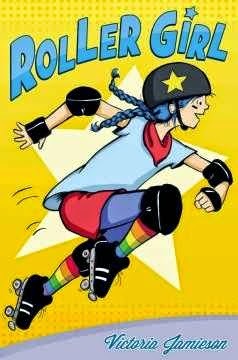 In a school library, this would be an ideal book to recommend to an elementary school reader. But in my library, the large chunks of text - usually a whole page or more - will discourage younger readers or parents from picking up the book to read aloud or struggle through on their own. 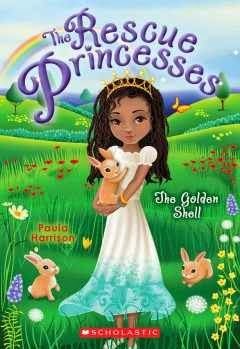 Elementary-age readers who can read this on their own are reluctant to pick up books that look like picture books. This is a weird peculiarity of my own town it seems, but one I've not been successful in getting over. A popular animal book like this one will probably circulate well, but Nic Bishop's titles, with less text and more photographs, have a wider audience. Verdict: If you need more frog books and have a strong elementary audience for nonfiction, this is a perfectly good selection. If you're a school library, I'd say it's a definite purchase. For my library, it's an additional purchase that I'll add if the budget allows. Jess made this. She has mad crafting skills. I have so many things to do. I am doing them like crazy. Luckily, I did not schedule a ton of programs this week and talked myself out of trying to do something fancy for Mad Scientists Club. ARE YOU CRAZY YOU CAN'T EVEN FIND YOUR TO DO LIST UNDER THE OTHER TO DO LISTS!! Also I am getting a cold or a sinus infection or something and losing my voice and have had a low-level headache for days. Fairy tale adventure went really well and we are all exhausted. Lots of happiness from patrons for the Fairy Tale Adventure, some great comments from parents on Bookaneers - it's doing what I wanted it to do, bring together kids at all levels and stages of reading to have fun with books - new families coming in via four year old kindergarten outreach, and a gazillion fairy tale books checked out. All the happys! This is a new nonfiction/adventure story blend that is sure to fly off your shelves. Russell is thrilled to be chosen for the Race the Wild competition, but dismayed that the rules have changed and instead of being with the four friends he applied with he's been moved to a team of strangers. He's also upset at his erstwhile friends' growing unsportsmanlike behavior. However, there's not too much time to dwell on his troubles since they're in the Amazon rainforest, racing to snap pictures of rare animals, solve clues, and beat the other teams! Kaban's black and white digital illustrations looked blurred and it was difficult to make out the details of the rainforest and the children. However, you can put that down to either my need for new glasses and/or a poor printing run. I really liked her art when I looked it up online, but either it doesn't translate well to black and white or it's cheap reproductions or some of both. Each chapter ends with two pages of information about an animal or aspect of the rainforest, with pictures. There is a preview of the next book, Great Reef Games and ads for other Scholastic series in the back. The story is brisk and well-paced and there are enough loose threads left by the end to entice readers to continue the series. How will Russell handle the problems with his former "friends", what secrets does his new team have, etc. I did feel that there were quite a lot of tantalizing hints that weren't followed up, like hints about where Mari's background knowledge comes from. I also had trouble keeping the four straight, but as this first book primarily gives a good introduction to Russell's character, I assume later books will focus on the other characters more.The book features a very diverse cast, but it's not part of the plot. Russell thinks about how the different teams are formed, but more in the gender than racial diversity aspect. Verdict: Is this likely to win awards? Nope. The writing is a little choppy, the pictures not printed well, and the plot has too many loose ends. Do I recommend it? Heck YEAH. Adventure, a diverse cast, realistic characters, just a hint of mystery, and nonfiction included. Exactly what your beginning chapter readers want and need to get them hooked on reading. It took me a while to get my hands on a copy to review, they've been flying off the shelf all summer. Buy them all! Buy two copies! Recommend them to I Survived fans! My feelings about easy reader biographies are pretty much the same as picture book biographies - I don't see the point. But I have a habit of buying every National Geographic easy reader that comes out because they're so popular so I purchased most of the biographies they put out, without even looking at them. Then Rosa Parks was nominated for Cybils and I took it home to read. It completely blew me away and is everything I always vaguely imagined an easy biography should be. The book starts with a simple explanation of segregation and how it affected every day life. Then it talks in simple terms about Rosa Parks' life as a child and the people who influenced her. There is a section that sets the scene for the pivotal events by relating things in the 1920s to today, from how much a bar of chocolate cost to games children played. The explanation of what could have happened to Parks is honest but not graphic. There are inset "Words to know" sections that explain difficult terms as they are introduced, like "boycott" and "protest." Additional facts about Rosa Parks' life are included as well as what happened after the bus boycott. There is a quiz and a pictorial glossary at the back of the book. One of the things I really liked about this book was that it simplified and made relatable historical events and people without glossing over facts or leaving things out. 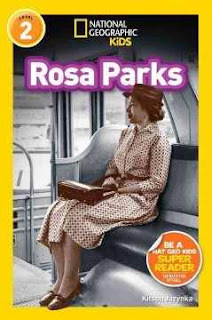 The book mentions at one point that Rosa Parks was not the first or only person to refuse to give up their seat, but that she was important in sparking the boycott. The book explains segregation and the time period in a way that kids will be able to relate to. It also talks about how Rosa Parks continued to fight against inequality and racism, helping kids understand that these are current issues, not things that only happened a long time ago. This is a level 2 reader and the main text is bold and simple. There are additional text boxes with smaller, more complex text, as well as captions, timelines, etc. A beginning reader could easily handle the central text with some help on the additions. Verdict: My perennial gripe about biographies for young children is that they don't give them any context or any way to link to the people they are presenting. This book does an amazing job of not only explaining the context of Rosa Parks' life, but why she is important and matters today. It explained confusing terms, included lots of interesting photographs, and was well-written and interesting as well as conveying important information. I can't wait to use this in a book club and I'm really glad I bought the National Geographic easy reader biographies, if they all turn out to be like this one! Egg Drop will always be my favorite Mini Grey, but that doesn't stop me from checking out every new creation she comes up with. Her latest is a wacky space adventure that will make kids giggle - and maybe pause to think a little as well. Space Dogs, Astro Cats, and Moustronauts are sworn enemies on Home Plant. Always have been, always will be. But when Space Dog rescues Astro Cat and then they both come upon Moustronaut, they make some surprising realizations - and have a tough decision to make. Grey's artistic genius lies in the details and this book is no exception. A sharp eye will catch all sorts of details from the newspaper headlines "First dog on Mars" to the titles on the houses of the people of Niblet 12 (hint - they're all munchies!). Her bug-eyed characters don't have a lot of expression, but they still have strong personalities all the same. One of the things I love about Mini Grey is her unexpected ending. 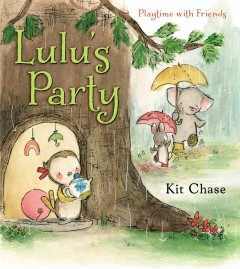 The expected ending of this book, of course, is for the three new friends to go home and change everything on their planet, with everyone getting along now that they know each other....but Grey (and her characters) have other ideas and in a twist ending they come up with their own happily-ever-after. Verdict: Aside from the mild message that maybe those who are "different" might have something to offer after all, this is just a fun romp in space. 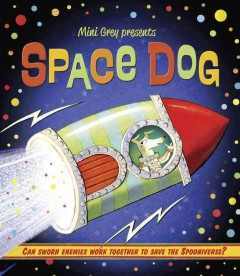 Whether or not kids take away the message of tolerance and friendship, they'll certainly have fun and might even want to write a few adventures for Space Dog, Astro Cat, and the Moustronaut themselves. This is a very unusual nonfiction book and an amazing one. Desmond's first book, Red Cat, Blue Cat was a delight and she doesn't disappoint in her second title. The story begins with the deep blue endpapers, showing the faint outlines of whales drifting across them and a small, strange green submarine perhaps? The opening pages are stark white, with an author's note about the history of blue whale endangered status. The title page shows a small child reading the book and we turn the page and the story begins....a child is lying on their bed reading a book about whales. As he reads, he is transported into the book. When the book talks about how much the whales weigh, the little boy skips up a giant pile of hippos, demonstrating just how heavy the whale gets. The spread talking about the whale's eye shows a giant, dark blue background and, slowly coming into focus, the deep black of the eye at the center. Another spread shows a colorful swarm of krill, the whale's food. The little boy hefts gallons of milk as the book explains how much milk a whale calf drinks. The story ends as the little boy drifts into sleep over his book and into the deep blue sea as he dreams of whales. The art and text are smoothly integrated into one lyrical whole with the collage and watercolor illustrations making the simple facts of the text memorable for the reader. It's dreamy and simple, but powerful. Verdict: You absolutely have to get this for all your whale fans. 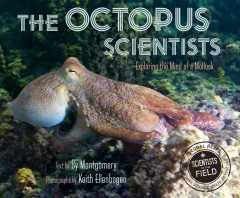 It would make a great book for parents and librarians who are a little nervous about introducing nonfiction to storytime and also to spark children's imagination. Teachers will find it an inspiration for helping kids understand large numbers and creating similar projects on favorite animals. Highly recommended. This is a running list of titles I have reviewed and also purchased for the library this year. I'm updating it roughly once a month, or when I think of it. This does not include titles that were review copies and were donated to the library, which is indicated in the review. For a complete list of new library materials, you can check out the library pinterest page!